Back in March I was complaining about the weakly written female protagonist in Seeker, and how much her characterization took away from the story, when a friend told me I really needed to read Throne of Glass. She promised me the main character was much better written. I believed her, but still didn’t manage to sit down with the book until this week, when I realized she was completely right. 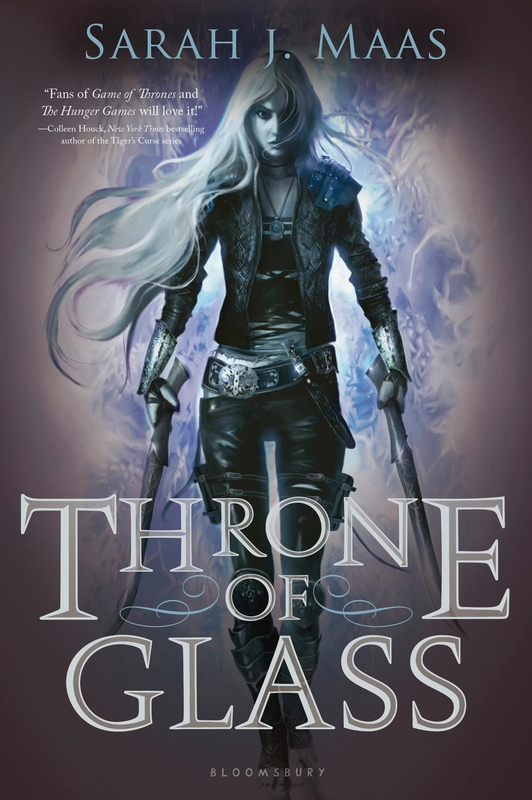 Throne of Glass is the first novel in a fantasy series by Sarah J. Maas. It’s technically a Young Adult novel, though most of the characters are a little older than you generally find within the genre. Celaena Sardothien is a successful and widely feared assassin who has been sentenced to work in a death camp after being caught. Then the Crown Prince of the kingdom comes to offer her a deal – represent him in a contest to choose the King’s Champion and she will be granted her freedom after a period of time. Celaena can’t refuse this offer. Throughout the course of the novel Celaena befriends Prince Dorian, as well as the Captain of the Guard, Chaol and foreign Princess Nehemia. She also must uncover an evil plot to murder the champions one by one. I read through this novel very quickly and am reading the second even faster. My friend was definitely right about the characterization of Celaena. She is one of the best female protagonists I have ever read in a YA novel. She’s strong and independent – but not only does she act independent, but she can actually take care of herself. So often novels have characters who put on the pretense of being strong, independent females, but ultimately have to be rescued by the love interest or some other man in their lives. Not Celaena. I don’t want to give away too many spoilers, but even near the end when she does need assistance, it’s fellow female characters who help her the most, not the men. One thing that annoys me over and over again with YA books is the female character’s stubbornness and determination to keep certain things secret, which ultimately leads to more trouble. Somebody dies, or gets kidnapped, or something more horrible happens and the heroine needs to be rescued. Not in Throne of Glass. Celaena has her secrets to keep, and there is a lot she doesn’t tell even those closest to her, but she’s completely capable of making these decisions on her own and of taking care of herself and whatever consequences she has to face. Instead of making her seem naive it develops the character more. I also really like how Maas goes against the typical formulaic YA plot. Yes, there is a romantic subplot, but it doesn’t play out exactly as one might expect and she continues to defy the stereotypical formula in the second novel. This book definitely stands out from the pack when it comes to the YA Fantasy genre, and I’m really glad I gave it a chance. This is definitely going on my recommend list for anytime anyone asks me about YA novels. I plan on finishing the second novel today and immediately diving into the third. There is also a collection of prequel short stories that I was told to read second, and I’m sure that’s good advice, however, when I finished Throne of Glass I needed to know what happens NEXT not what happened BEFORE. So I’ll probably save Assassin’s Blade for once I’ve finished the three novels that are currently available. Lastly, one of the things I really loved about Celaena is the fact that she’s still a girl. I feel like so often people believe that in order to have a strong female character you need to strip away anything that makes them feminine. But Celaena is still very much a girl, and reminds me of Buffy in some ways – in that, deep down she would love nothing more than to just be a normal girl. Celaena’s love of puppies, candy, dresses, and balls not only shows us that underneath everything she’s still a girl, but it also shows everything she likely missed out on growing up in the Assassin’s Keep, and especially during her imprisonment. We also get to see that she’s not completely fearless, but overcomes her fears in order to do what must be done. I love seeing a female character that is able to be so feminine and human, yet still be completely capable of taking out anyone who gets in her way. So, if, like me, you’re tired of how female protagonists in YA novels are frequently written, give this one a try before you give up altogether. Plus there’s action, intrigue and just enough romance – all the right ingredients for a fun YA read. Fans of Maria Snyder’s Study series might particularly enjoy this series; I’ve noted a lot of similarities as I’ve been reading.